MCKINNA owners keep coming back! Having been a boater all my life, I felt I knew enough to make an intelligent purchase of a new boat. My 60 foot Sportfisher was ready for replacement so I started looking for something newer and larger. Several boats were of interest to me but one in particular seemed exceptionally impressive for the price. That boat was a MCKINNA 69 Skylounge which was still in the design phase. I was reluctant to order a boat from a drawing without inspecting and sea trialing it first. I went ahead and met with the owner of MCKINNA YACHTS, Garret Martin, and discussed the details about MCKINNA’s new model. The meetings went well and I was impressed with Garret’s knowledge and attention to detail. I decided to place a deposit. I then spent many hours working with Garret and his associate, Gary Stevens, in making the numerous personal preference decisions needed to make the finished product. Throughout this process I felt confident about MCKINNA as well as Garret and his staff. I never felt that this company had any intentions of placing profit in front of building the best boat possible. Many dollars were absorbed by MCKINNA YACHTS in additional improvements as construction continued. The much anticipated day finally came when my new boat arrived into the port of San Diego. From the moment I first saw her and to this day, the boat continues to amaze me. As I enjoyed my new boat a few service items arose. I also decided to customize my boat further. Garret and his crew were diligent and professional in taking care of all service items as well as my personal additions. They continue to provide me with reliable service to this day. As a bonus, the MCKINNA crew made sure I thoroughly understood every system on board and were available to answer any and all questions. The service I receive from MCKINNA is exceptional!!! I bought a 2004 MCKINNA 57' Pilothouse to replace my Tiara 35. Over the past several years I've learned a lot about boats, deepened my families appreciation of boating and shared many great times with my friends and business associates while aboard my MCKINNA. The MCKINNA 57 is a great boat and I truly had an emotional attachment to my "condo on water”, but like most boat owners, I anticipated moving-up to my next boat. A year ago, at the Lido Boat Show in Newport Beach, I toured the new MCKINNA 60 Pilothouse and realized it was the boat of my dreams. I remember being “blown away” by the craftsmanship of the interior, the high ceilings (I am 6'2"), the stand-up engine room, the broad beam and the external lines of the boat. It was beautiful! 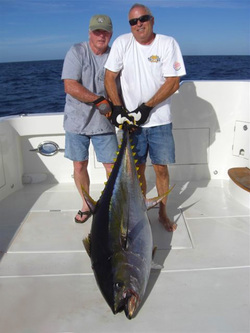 Having worked with Garret Martin and Gary Stevens of MCKINNA YACHTS, I had confidence in their organization. I normally don't trust sales people, but found them to be genuine, down to earth and men of their word. These characteristics in combination with performance make this team extremely trustworthy. They never let me down or point fingers in other directions. They make sure I am always a happy boat owner and they stand behind their product. When they told me they had a boat available that was similar to the one I had seen at the boat show, my interest peaked. They worked with me and we sealed the deal with a handshake. Since then, they have performed amazingly, actually doing everything we had verbally agreed upon. They have follow through! I now have my new boat and I am in love once again. My wife has always enjoyed boating but now passionately looks forward to spending time aboard. The MCKINNA 60 is all I have ever dreamed of and more! In fact, I tell myself many times, "I can't believe I own this boat". 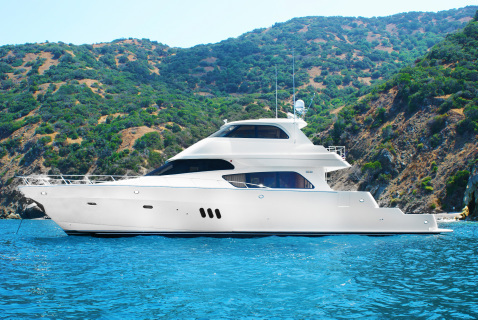 By having an organization like MCKINNA YACHTS behind my purchase, it enhances my pleasure, since I know I will not have to fight for my rights. I know they will be there for me and they actively want me to enjoy their product. With this kind of treatment, I will not hesitate to buy my next boat from MCKINNA! We purchased our first MCKINNA, a 57 Pilothouse, in 2003. We knew the minute we came aboard that this was the boat we had been looking for. We truly enjoyed our time on the original “Slip Away”, but when we heard that MCKINNA was building a 60 Skylounge with full walk-around side decks, we knew it was time for the next boat. We took delivery of the second “Slip Away” and have spent many wonderful hours aboard with friends and family. The navy blue hull and graceful lines are attention grabbers while on our mooring in Avalon Harbor. Working with Garret and Gary and all the staff at MCKINNA during the design and build was effortless. They listened to what we wanted in a boat – a light, bright, casual environment where everyone feels comfortable and relaxed – and with their expert guidance we now have the boat of our dreams – right down to the wine refrigerator in the salon! Their concierge service makes using the boat a breeze – they take care of scheduling the washing, bottom cleaning, fueling, and pump outs. A fully catered party complete with captain is only a phone call or email away with this service. They will even provision the boat for trips upon request. We receive one monthly bill for it all – what could be more convenient and easy! Everyone at MCKINNA is always available for any questions or requests we may have. We truly feel a part of the MCKINNA family! Nearly six years ago, I purchased a new MCKINNA 57 Pilothouse. I have made trips in excess 1,300 miles in a variety of conditions, and have been caught in 40+ knot winds on several occasions. I have always felt safe in my boat! I also feel that she gives a very comfortable ride. As a boat owner, I’m constantly looking at other boats. As I dig around in the bilges and other areas of various boats, the more I appreciate the build and design qualities of my MCKINNA. When I go to boat shows with the idea of buying a new boat, I walk away with the feeling that my MCKINNA is fulfilling my desires and needs perfectly. Bad news for boat salesmen! She has been a trouble free boat, and the “new boat bugs” were minimal. The support I have received has been outstanding, both at the time of the sale and even now (more than five years later). 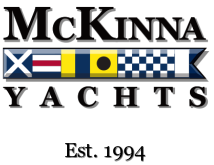 I would not hesitate to purchase another MCKINNA or do business with their team of professionals, both sales and service!